These TOPEX/Poseidon data, collected over the latest 10-day sampling cycle, March 1 to 11, 2000, show the La Niña condition still exists. The image of sea surface heights reflects unusual patterns of heat storage in the ocean. Sea-surface height is shown relative to normal height (green). The cooler water (blue and purple) measures between 8 and 24 centimeters (3 and 9 inches) lower than normal. 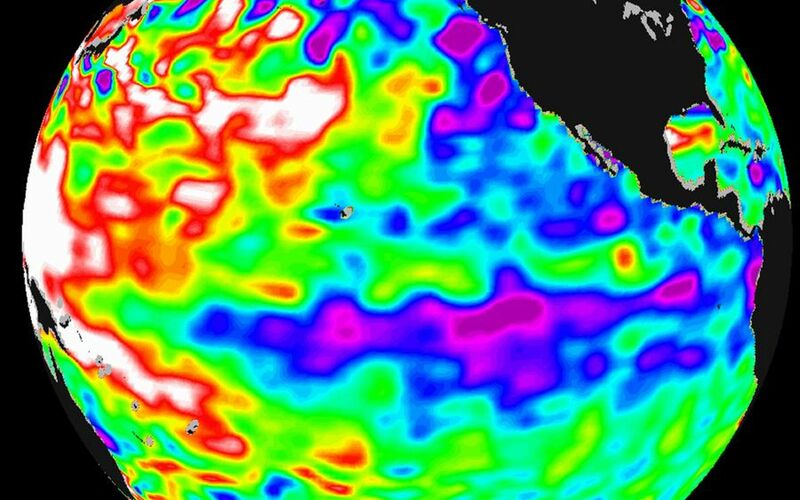 The giant horseshoe of warmer water (red and white) continues to dominate the western Pacific with higher than normal sea-surface heights between 8 and 24 centimeters (3 and 9 inches). This view of the oceans from TOPEX/Poseidon is an input to the National Oceanic and Atmospheric Administration (NOAA) seasonal forecasts. 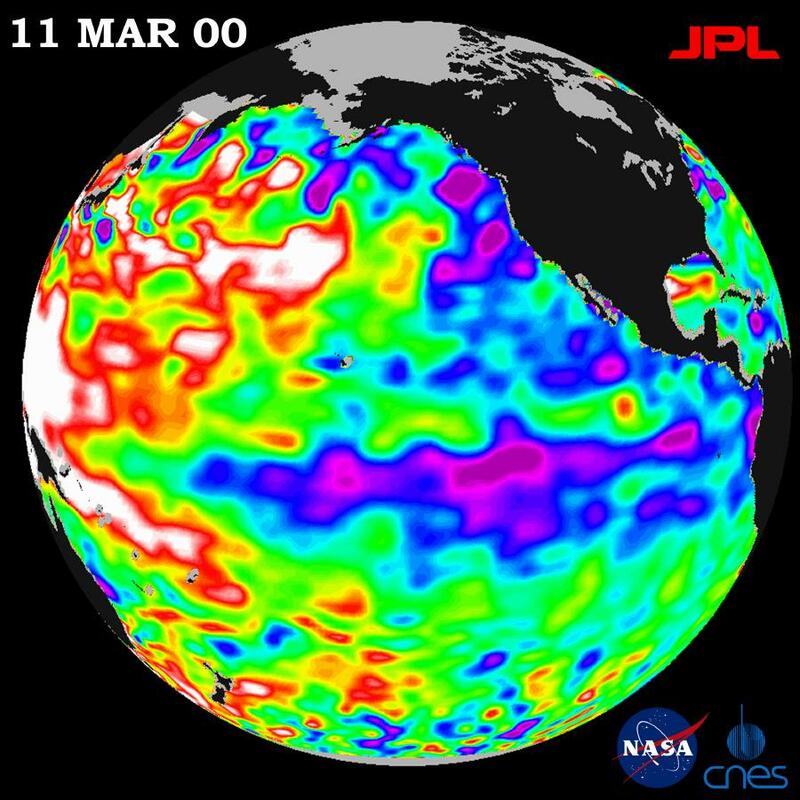 The impacts of current ocean conditions in the Pacific for spring in the U.S., according to Dr. Ants Leetmaa, director of NOAA's Climate Prediction Center, imply drier than normal conditions for much of the southern half of the U.S. Leetmaa says the conditions also indicate above-normal rainfall in the Pacific northwest, and a warmer than normal U.S., except for the west coast where spring conditions will be near normal. 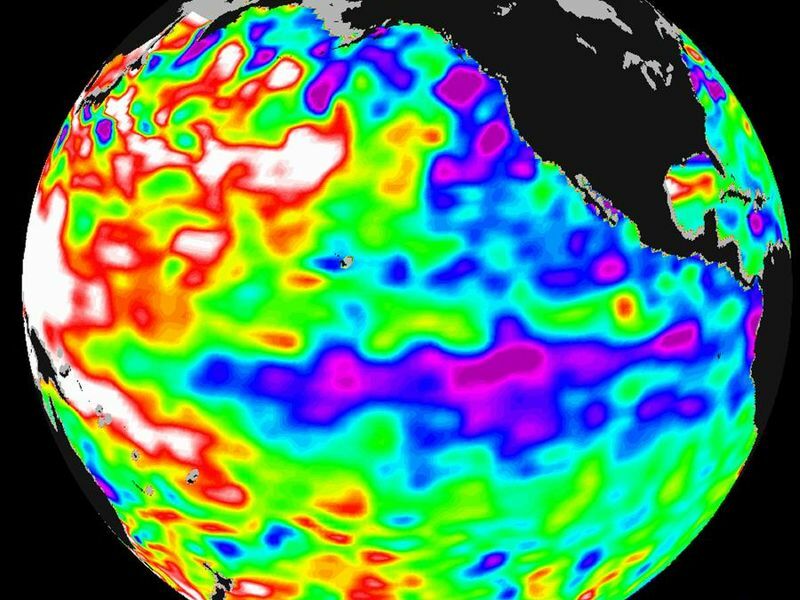 Scientists continue to debate whether this image hints at the presence of a large, longer lasting climate pattern, the Pacific Decadal Oscillation. 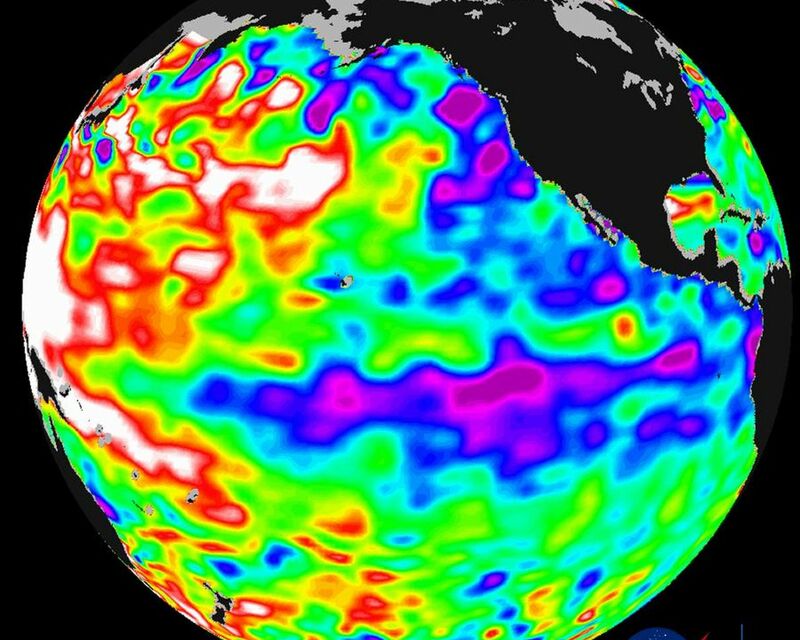 This long-term pattern that covers most of the Pacific Ocean has significant implications for global climate, especially over North America. The U.S.-French TOPEX/Poseidon mission is managed JPL for the NASA's Earth Science Enterprise, Washington, D.C. JPL is a division of the California Institute of Technology in Pasadena.